AT&T has a new iPhone app that lets U-verse digital TV subscribers download and watch free, selected TV shows from "several popular networks" right on their handsets. The company didn't specify which television shows or networks would be available through the new app, called U-verse Mobile. 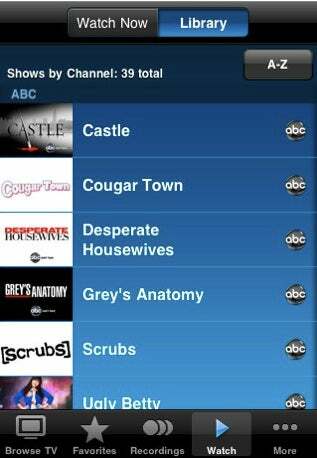 But a quick glance at the app's screenshots on iTunes shows a number of popular ABC network shows available for download including Cougartown, Ugly Betty, Gray's Anatomy and Castle. AT&T promises to add more downloadable content in the future. To watch and view downloadable content, you must be a subscriber to U-verse's U300 package or better. All shows are downloaded via Wi-Fi and are not available using your iPhone's 3G connectivity. U-verse Mobile replaces an older remote access iPhone application from AT&T, but the new app includes many of the functions found in previous versions. You can use U-verse Mobile to remotely manage and schedule DVR recordings, view and search channel guides, and bookmark favorite shows and networks for easy access later on. U-verse Mobile will likely be a welcome upgrade for some U-verse subscribers, and the app provides more functionality than a similar remote access app from AT&T U-verse competitor, Dish Network. Nevertheless, AT&T's U-verse app could have been better. One glaring omission is the lack of place-shifting technology that would allow you to watch your recorded DVR content remotely. Slingbox Mobile, for example, allows you to watch live or recorded content from your home TV on your iPhone via Wi-Fi and 3G. It's anybody's guess as to why AT&T wouldn't include such an obvious perk. One possibility is that AT&T didn't want to add even more video streaming to its already iPhone-plagued network. Then again, AT&T hasn't released an iPad-specific version of U-verse Mobile yet, so perhaps the future has more goodies in store for U-verse subscribers. If you're already an iPhone owner, and want to give U-verse a try, AT&T has a special offer for you. AT&T iPhone users who sign up for the U-verse U300 or U450 packages will receive a $75 iTunes gift card (new customers only). Click here to go to AT&T's U-verse Mobile app on iTunes. The iPhone 4 is a major upgrade from its predecessor, the iPhone 3GS, in everything from the camera quality to data speeds.